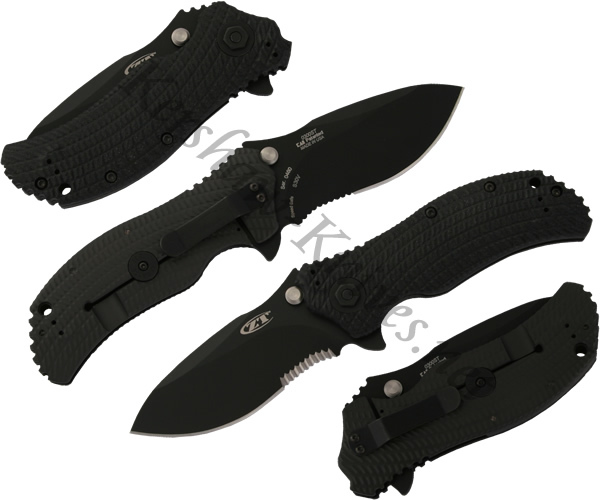 The Kershaw Zero Tolerance 0300ST combat folder knife has a partially serrated S30V blade with a tungsten dlc coating. The tungsten dlc gives it the distinctive blade non-reflective look and helps with corrosion resistance. This knife is assisted opening and can be deployed using either the ambidextrous thumbstuds or the flipper on the back of the handle. The handle has 3D machined textured G-10 for excellent gripping power. This knife is MADE IN THE USA.